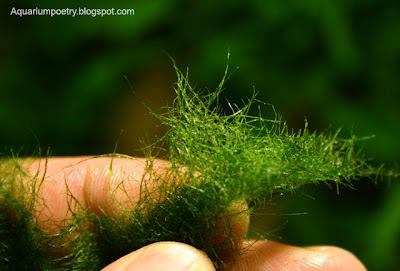 Cladophora is a branching, green filamentous alga, that forms a moss like structure. This algae doesn't appear to be slimy. Threads are very strong and very thin. It grows on rocks and submersed wood exposed to direct light, in very bad cases will grow on plants also. Usually it tend to stay on one spot, which makes it easy to remove. 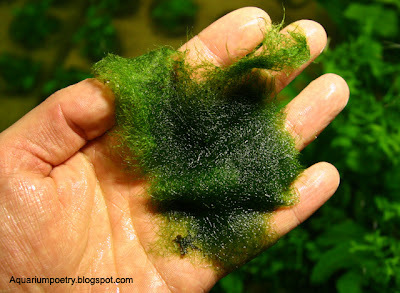 Comb it and dose more CO2 and improve water circulation for better nutrient transport. In a case where Cladophora takes over the grassy plants, mow the plants like the lawn. 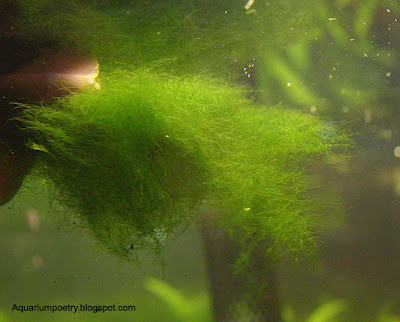 No algae eater is known to eat this kind of algae.Photos by Dusko Bojic.